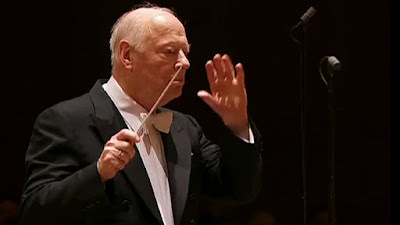 The maestro: Bernard Haitink returns to the Philharmonic. Photo by Chris Lee © 2014 New York Philharmonic. 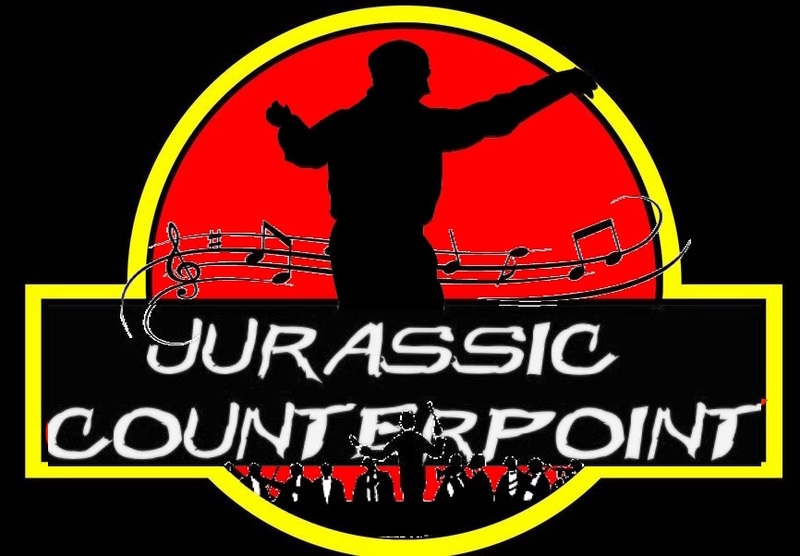 As the concert season hits its spring homestretch, Superconductor blows the dust off an old idea, a comprehensive concert calendar previewing what's coming up with a given organization or venue. In this case, we're previewing the month of April at the New York Philharmonic, which offers five seperate subscription concerts at its longtime home David Geffen Hall. The Herbert von Karajan Parsifal. of Parsifal. Art © 1980 Deutsche Grammophon/UMG. The first notes of the Prelude seem to float out of the speakers: a rising figure for cellos and bassoons, later ornamented with shimmering strings and the lilt of harps. There are no coughs, no rustles of cloth, and when the orchestra stops, the silence is absolute. 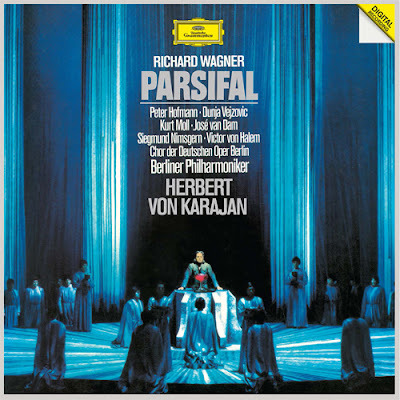 This is the opening of Herbert von Karajan's 1979-80 recording of Parsifal, Wagner's last opera. It could be argued that this Deutsche Grammophon release, which has enjoyed 35 years in the catalogue, is the finest of the Austrian conductor's nine studio recordings of the major Wagner operas. 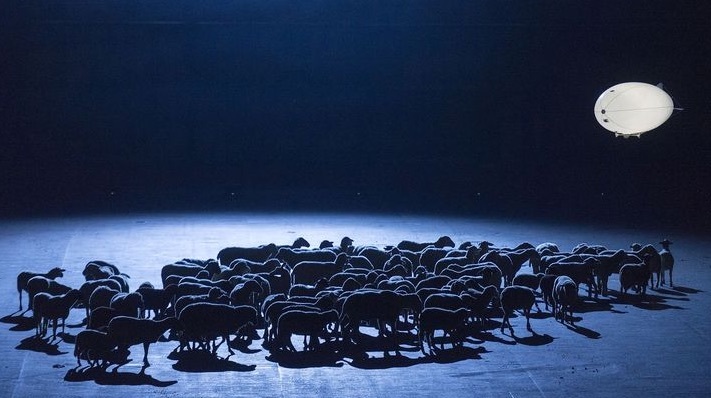 The Park Avenue Armory stages Louis Andriessen's De Materie. A zeppelin watches its flock in Part IV of Louis Andriessen's De Materie. Photo by Wonge Bergmann for the Park Avenue Armory © 2016 Park Avenue Armory. The yawning black void of the Wade Thompson Drill Hall at the Park Avenue Armory is the largest theatrical space in the art music community of New York City. This week, that vast black slate is the playground of director Heiner Goebbels and the first North American stage production of De Materie, a sprawling two-hour work by the Dutch composer Louis Andriessen. Like some of the larger works by Hector Berlioz, De Materie falls somewhere between enormous symphony and fully staged opera. This work is both staggering in its achievement and bewildering in scope, an expression of what can be achieved when a composer's imagination meets a director's enormous budget. YUNDI plays Chopin at Carnegie Hall. The pianist YUNDI in action. Photo © 2014 EMI Classics. 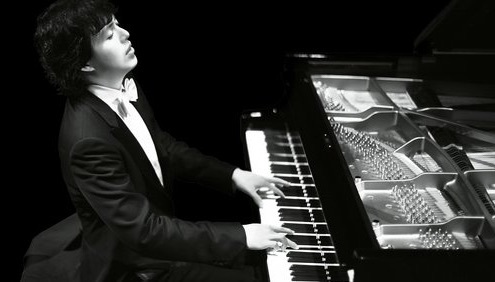 The pianist YUNDI is a bona fide sensation, spreading the gospel of Chopin's music to appreciative audiences around the globe. (He is now referred to on posters and in program notes as YUNDI (sic) with each letter having equal importance to the others, recalling the time one Homer Simpson changed his legal name to MAX POWER.) On Wednesday night, Yundi (we're not going to capitalize his name each time, just use your imagination or download the post and edit it yourself) played an all-Chopin recital at Carnegie Hall, surveying that composer's complete Ballades and Preludes. This formidable pairing drew from his two recent recordings on DG. 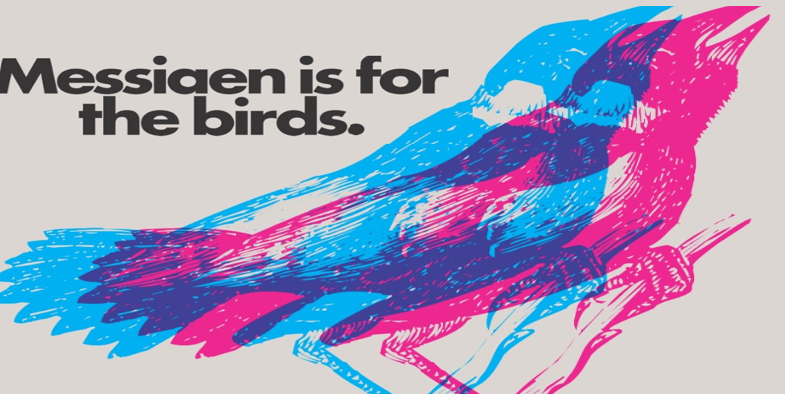 It is music that requires great versatility and skill on the part of the artist. ¡Figaro! (90210) bows at The Duke on 42nd Street. enthuses about their new apartment in ¡Figaro! (90210) at Tthe Duke on 42nd St. Attempts to update the Mozart-Da Ponte operas to a modern setting have often met with mixed results. One may remember Peter Sellars' Cosí fan tutte set in a diner, or the 2009 City Opera production of Don Giovanni that moved the entire opera to a funeral home. This week, the Duke on 42nd Street welcomed the Broadway premiere of ¡Figaro! (90210), which transports the madcap events of The Marriage of Figaro at a nouveau riche dream palace in Beverly Hills, California. Plácido Domingo descends (literally) into Genoese politics. 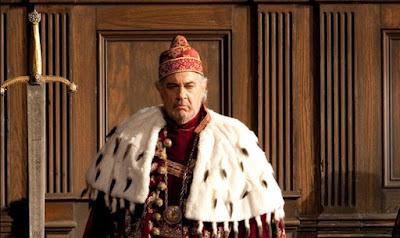 Don't mess with the Doge: Plácido Domingo scowling in Simon Boccanegra. Verdi’s most political opera chronicles a power struggle in Renaissance Genoa, balanced with the touching story of a father reunited with his long-lost daughter (who happens to be in love with a guy on the other side of the conflict.) Placido Domingo continues his late-career efforts to sing baritone repertory in the title role. 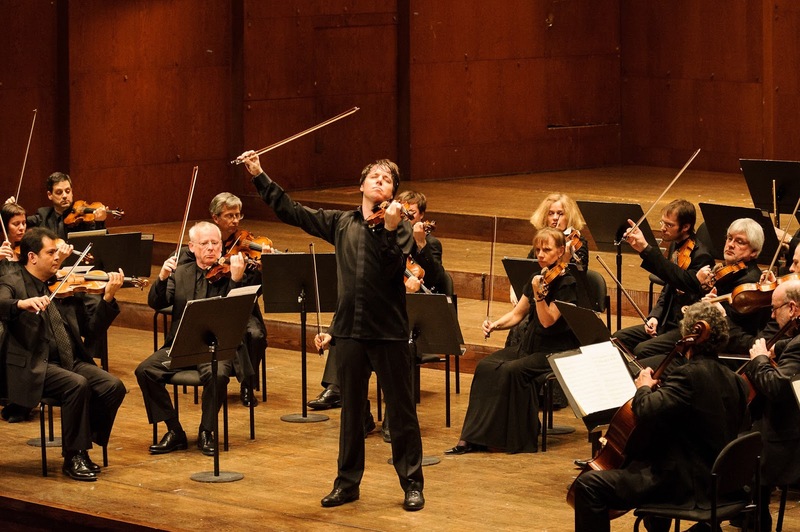 Joshua Bell leads the Academy of St. Martin-in-the-Fields. at Lincoln Center's David Geffen Hall. 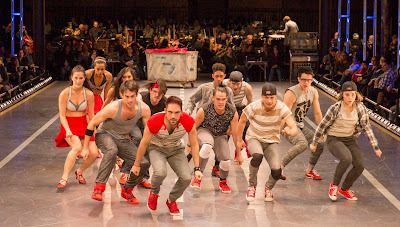 Photo by Ian Douglas © 2015 Lincoln Center for the Performing Arts. 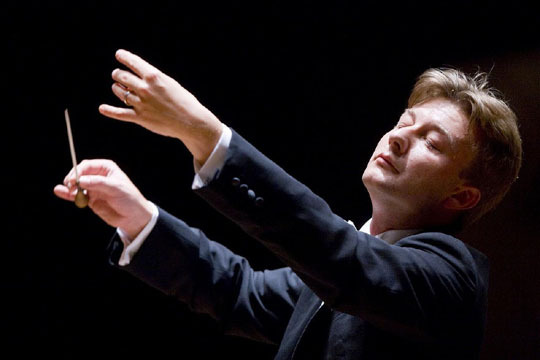 What is the role of a music director? Is it necessary for them to be in white tie and tails in front of the orchestra, slashing the air with a white baton to direct the players, a set of gestures that can have the unintended effect of hypnotizing the audience who think that their job is to watch the conductor? Sibelius, Shostakovich and Salonen at the Philharmonic. as the New York Philharmonic plays on behind them. 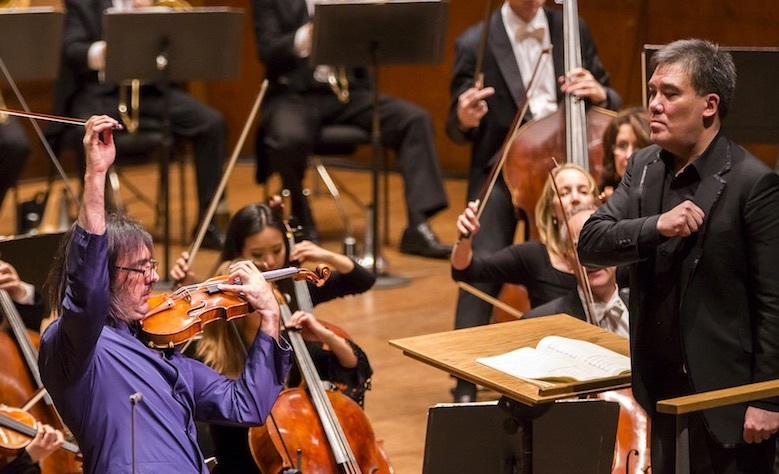 Alan Gilbert is back at the helm of the New York Philharmonic this week. This concert program was something of a watershed for the orchestra's music director, who has grappled with "lame duck" status since it was announced (one year ago) that he would step down at the end of next season. This week's concert program juxtaposed a post-Romantic favorite alongside a Russian rarity and Karawane, a new work by current Philharmonic composer-in-residence Esa-Pekka Salonen. The American Symphony Orchestra plays Max Reger. Photo alteration by the author, a parody of Jurassic Park © 1994 Amblin Entertainment. Max Reger belongs to a shadowy period at the turn of the 20th century, a sort of missing link between the Romantic harmonic complexity of Brahms and the atonal revolution led by Arnold Schoenberg and the Second Viennese School. Yet his major works stand largely ignored, dismissed as difficult dinosaurs that are ignored by most pianists and orchestras. They're long. They're complicated. And they translate 18th century ideas of polyphony and counterpoint to the modern orchestra, offering solid musicianship that, in the wrong hands can be sober and heavy-handed. Christian Arming conducts the NJSO at NJPAC. 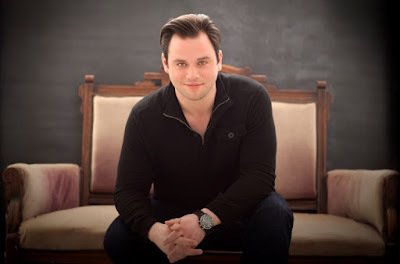 On Thursday afternoon at the gorgeous (but never full) New Jersey Performing Arts Center (NJPAC) it was the turn of Austrian conductor Christian Arming to lead the New Jersey Symphony Orchestra in a program of Wagner, Schumann and Brahms. Mr. 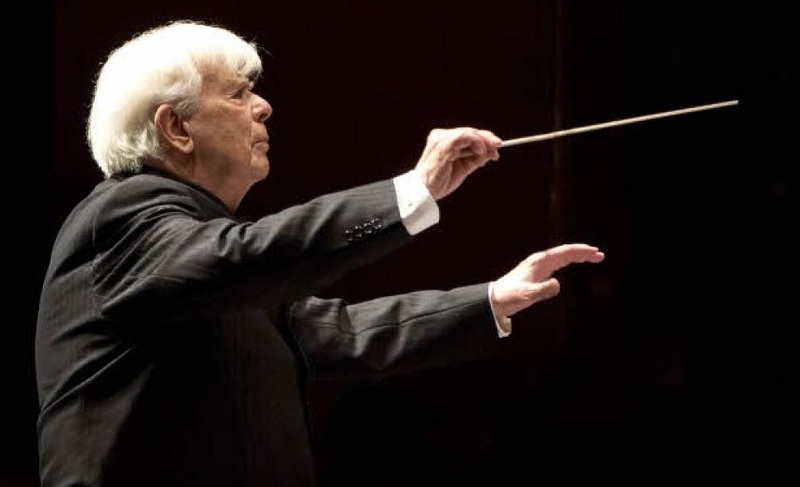 Arming, a protégé of Seiji Ozawa and the current music director of the Liège Royal Philharmonic in Belgium revealed himself to be a conductor of insight and considerable ability. His skills became apparent early with a slow and transparent reading of Wagner's Siegfried Idyll. The Orchestra symphonique de Montréal returns to Carnegie Hall. 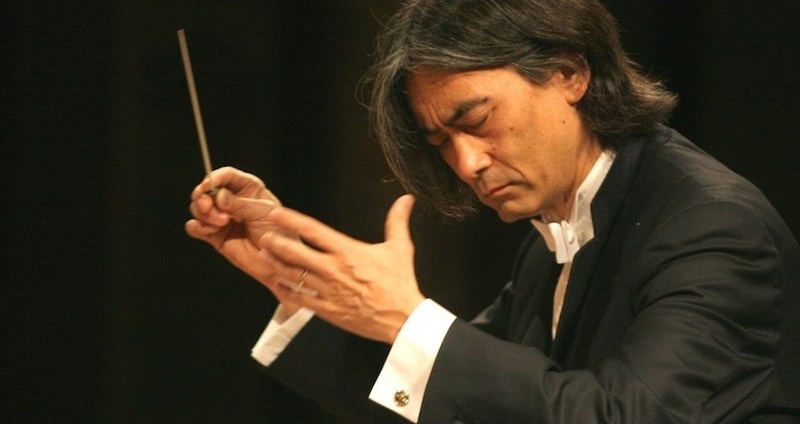 Kent Nagano. Photo courtesy Orchestre symphonique de Montréal. Ten years ago, Kent Nagano became music director of the Orchestre symphonique de Montréal. Once regularly recorded with a fat contract on Decca classics the ensemble had suffered a falling-off following the abrupt 2002 exit of artistic director Charles Dutoit. As a result. the past ten years have seen only infrequent visits to venues like Carnegie Hall. On Tuesday night, the OSM returned to that historic stage with a program of Ravel, Beethoven and Stravinsky, designed to show their many strengths and hopefully guarantee more frequent visits. Labels: Carnegie Hall, Concert Review, Kent Nagano, Maria Joao Pires, Orchestre symphonique de Montreal, Paul Pelkonen, Superconductor. 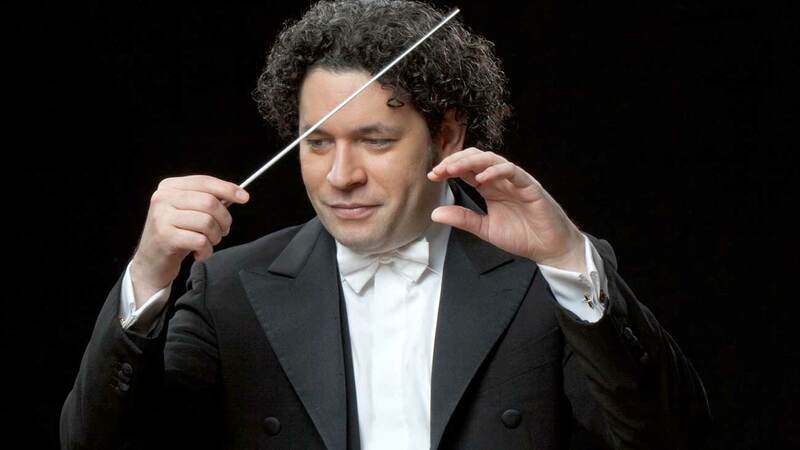 Gustavo Dudamel conducts the Los Angeles Philharmonic. The man. The myth. The tux. Gustavo Dudamel. Photo © 2016 Los Angeles Philharmonic. The Los Angeles Philharmonic is riding high right now, with Gustavo Dudamel at their helm and a glittering Frank Gehry-designed palace, the Walt Disney Concert Hall to play in. 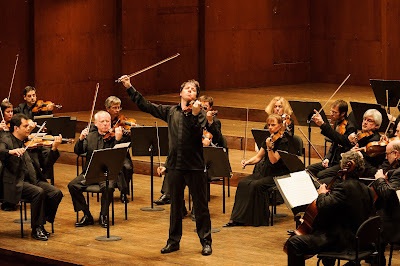 On Monday evening Mr. Dudamel and the orchestra made the second of two appearances this season at David Geffen Hall. This Lincoln Center venue was touted as state-of-the-art at its opening in 1964 (as Philharmonic Hall) has been plagued with acoustic problems over its 52-year history. In fact, the venue formerly known as Avery Fisher Hall is slated for a multi-million-dollar "gut renovation "by the end of this decade. The former Master of the Queen's Music was 81. 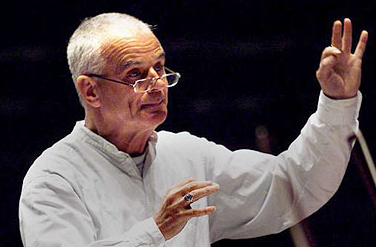 Composer Peter Maxwell Davies. Photo © Stephen Lock. Sir Peter Maxwell-Davies, the groundbreaking British composer known for bold symphonies and iconoclastic operas died yesterday at his home on the island of Sanday in the Orkney Isles. 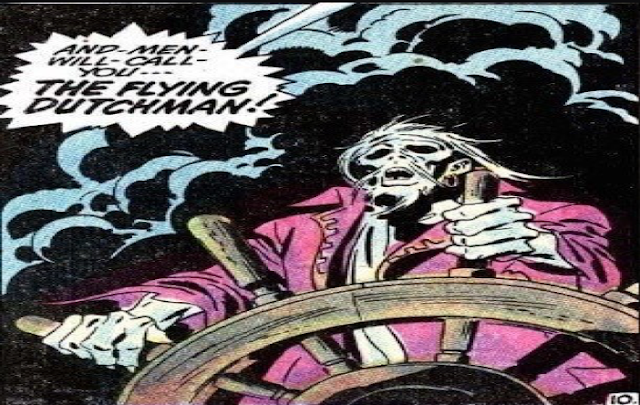 His death was reported by the BBC. The composer was 81. He had been suffering from leukemia in recent years. Gustavo Dudamel conducts the Mahler Third. 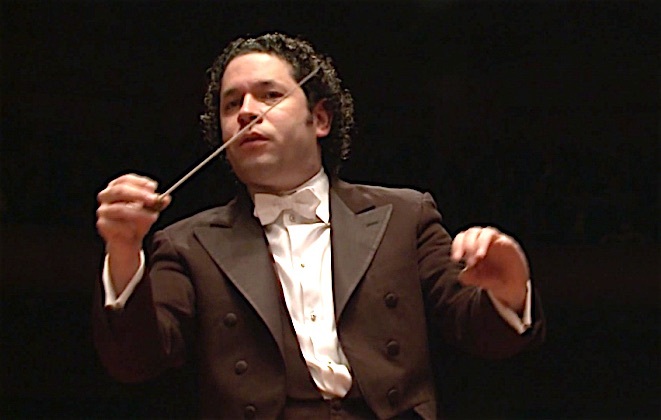 The Dude abides: Gustavo Dudamel. For Gustavo Dudamel, the Venezuelan conductor who wears his fame like an easy evening cloak, any concert in New York is a big deal. On Sunday, Mr. Dudamel brought his Los Angeles Philharmonic to Lincoln Center for the first of two concerts. This opener featured Mahler's giant-sized Symphony No. 3 in D Minor, a 100-minute exercise in world-building that ranks as the longest symphony to hold a place in the standard repertory. In it, Mahler depicts nothing less than the entire cosmos, from the birth of his beloved Alps to the rewards of heaven and beyond. Sondra Radvanovsky is (once more) the Queen of England. in the title role of Donizetti's Roberto Devereux. 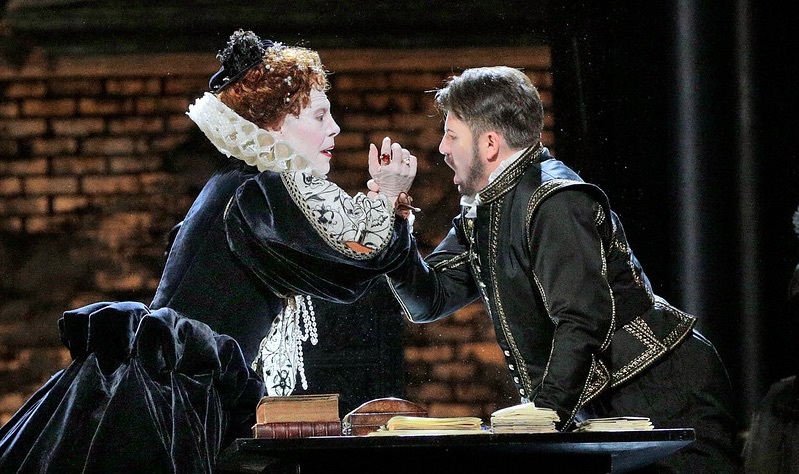 The last of Donizetti's informal "three queens" trilogy puts soprano Sondra Radvanovsky in the spotlight as Elizabeth I, the Queen of England. 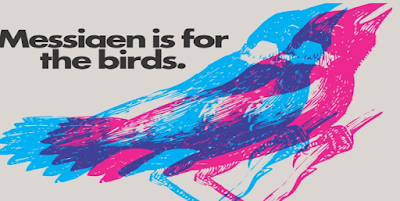 The opera recounts a tragic love triangle involving the queen, with fatal consequences for the tenor. 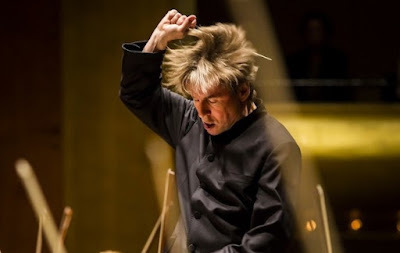 Esa-Pekka Salonen leads the Turangalîla-symphonie. at David Geffen Hall this week. Photo by Chris Lee © 2014 The New York Philharmonic. Since its premiere in 1949, Olivier Messiaen's Turangalîla-symphonie has stood alone. Consisting of ten enormous orchestral movements and spanning nearly an hour and a half, this piece that strikes terror into the hearts of conductors and concert-goers. In the wrong hands, this mega-symphony can be a lumbering beast, a composer's ego out of exploding in a flurry of orchestrated bird-song and strange chromatic ideas that can (literally) send patrons running for the nearest exits. The rock keyboard legend found dead at 71. 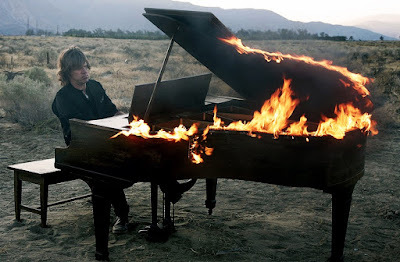 He was a lucky man: Keith Emerson. Photo by Michael Tweed. Keyboardist Keith Emerson, founding member of the supergroup Emerson, Lake and Palmer and a pioneer in bridging the gulf between rock and roll and classical music, was found dead at his home in Santa Monica, California yesterday. The cause of death has been confirmed by Santa Monica police as a self-inflicted single gunshot wound to the head. Loft Opera goes to the mattresses with Tosca. Puccini's Tosca at LoftOpera. Photo by Robert Altman © 2016 LoftOpera. The industrial warehouses that line the Long Island Rail Road tracks on the north side of Flushing Avenue in Bushwick are used for myriad purposes: art studios, rehearsal rooms, and (presumably) past underworld activity. This month, the old bus depot at 198 Randolph Street is home to LoftOpera, and the three-year-old company's first-ever foray into the murky waters of grand opera. 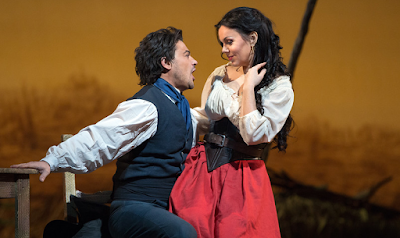 Thursday was opening night, and the company put its back into mounting a budget-friendly and yet compelling version of Puccini's bloody thriller. This was the second Puccini production for this young company, and a watershed, as Tosca is rife with technical challenges and many dramatic and vocal pitfalls. Pianist Eric Huebner gives a Messiaen Week recital. If you were to list the great concert pianists on the classical scene today, you'd probably miss Eric Huebner. That's because Mr. Huebner is the current holder of the piano chair with the New York Philharmonic. He spends most of his time providing 88-key support in major orchestral works and occasionally playing chamber music with other orchestra members. On Wednesday night, the Philharmonic's current Messiaen Week festival offered Mr. Huebner a chance at the solo spotlight with a recital all to his own. The Philharmonic makes CONTACT! to open Messiaen Week. Taxi! 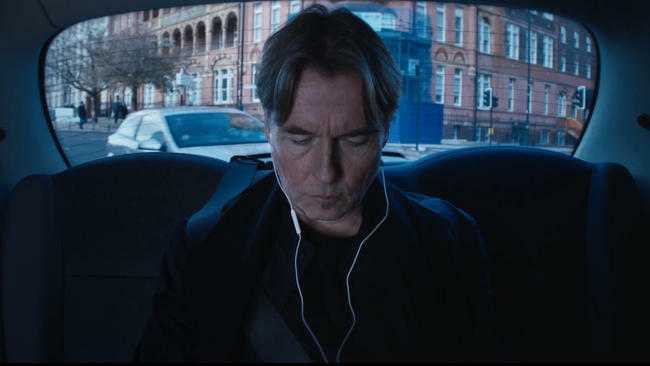 A still from Esa-Pekka Salonen's commercial for Apple's iPad Air. Image © 2015 Apple Inc.
Donizetti's Chianti-fueled comedy returns to the Met stage. the company's revival of L'Elisir d'Amore. Photo by Marty Sohl © 2016 The Metropolitan Opera. 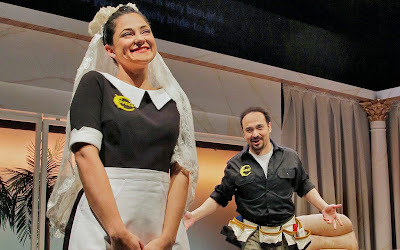 The Met opened the 2012 season with this Bartlett Sher staging of Donizetti's L'Elisir d'Amore, the frothy bel canto comedy where a country bumpkin wins the girl with help from a very special bottle of vino. Here, Alexandra Kurzak returns to the Met stage to take over the role of the fiery (but lovable) Adina. As the lovestruck bumpkin, Vittorio Grigolo gets to sing some of the most famous music in the tenor rep.
Carnegie Hall's Somewhere Project mounts West Side Story. The Jets (with Manny Stark, center, as Riff) land at the Knockdown Center in West Side Story. Photo © 2016 by Richard Termine, courtesy Carnegie Hall Public Relations Department. The music of Leonard Bernstein is the heartbeat of New York City. That was the thesis behind the Weill Music Institute's Somewhere Project, a prodigious initiative to celebrate art, song and music education as well as commemorate the current and 125th season of Carnegie Hall. The project reached a climax of sorts this weekend with the mounting of two performances of West Side Story at the Knockdown Center, a former glass factory on the leading edge of Maspeth, Queens. The master of period performance was 86. 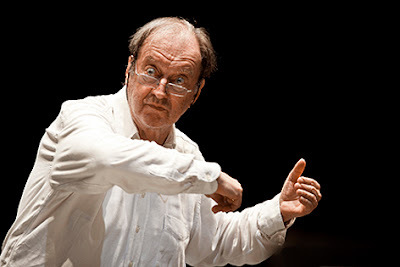 Austrian conductor Nikolaus Harnoncourt, who spearheaded the revival of baroque instruments and period performance practice in the course of six decades on the podium, has died. The maestro was 86. Christoph von Dohnányi leads Ein Deutsches Requiem. Photo by Silvia Lelli © 2015 Salzburg Festival. In the weeks following the attack on New York on September 11th, 2001, Brahms' massive choral work Ein Deutsches Requiem has acquired special significance for the New York Philharmonic. For it was then that music director Kurt Masur chose the work to comfort and soothe the trouble city which was coping with inexplicable violence and terrible grief. This week, the Requiem returned to New York under the aged but firm hand of Christoph von Dohnányi to offer its unique message: an emphasis of comfort to the bereaved. 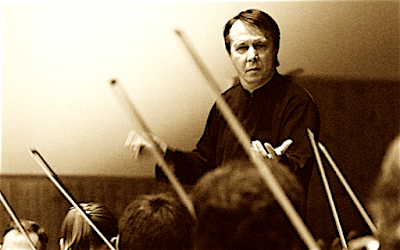 Mikhail Pletnev brings the Russian National Orchestra back to Carnegie Hall. The conductor Mikhail Pletnev at the helm of the Russian National Orchestra. The Russian National Orchestra is a youngster among the major orchestras of the world. Formed in 1989 in the wake of Perestroika and the optimistic presidency of Mikhail Gorbachev, the RNO has been led for its entire existence by Mikhail Pletnev, a virtuoso pianist turned conductor. With all their musicians hand-picked by Mr. Pletnev, they sound quite unlike any other ensemble. Performances turn on Mr. Pletnev's maverick, occasionally puzzling interpretation choices in standard repertory, with an emphasis on Russian classics and very little in the way of modern music. Christoph Eschenbach conducts the New York Philharmonic. 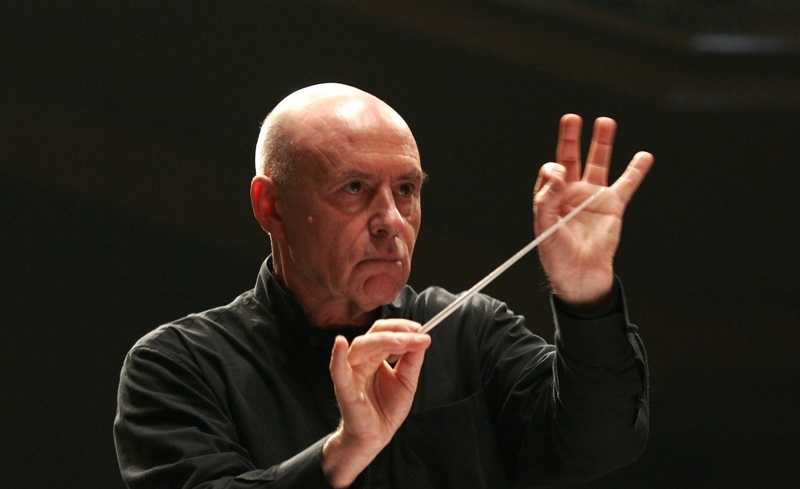 Christoph Eschenbach. Photo © 2016 IMG Artists. Most reviewers see concerts, and especially those by the New York Philharmonic, on opening night. But there's something to be learned from going to the Tuesday night performance of a concert program. Would the musicians, having played a piece all weekend be on orchestral autopilot? Or will they add that extra grain of inspiration in their last collaboration of the season with a well-known guest conductor.